The chickens are here!! Actually, they’ve been here for two weeks, but I’ve been lax in my blogging duties (I know, I know). They are lovely, lovely ladies, who are understandably leery of us but very, VERY slowly starting to warm to their new habitat, humans, and canine. We have three hens, and they are “Buff Orpingtons.” When people asked me what kind of chickens we were getting, I kept repeating “buff orpingtons,” not realizing that “buff” is their color, not the first word in a two-word breed name. Buff, in the orpington kingdom, translates, roughly, to gold. The girls are so pretty; I love looking out the kitchen window and seeing them against the green grass. Once their bright red combs are fully up, they’ll be a living reference to Karma Chameleon! So, this is what they mean by "predator proof"
I found our ladies by emailing a bunch of organic poultry farms in the area. The wonderful proprietors of KG Acres Farm and Featherwerks wrote me back and offered to let us adopt the girls from their flock. They are approximately 12 weeks old, their combs are starting to emerge, they eat like they’re ALWAYS starving, and they’re getting bigger all the time! In addition to their “Egg-A-Day” rations, they eat much of the fruit and veg that we don’t. They love apples, yellow squash, strawberries, clover, and fight each other over worms. They don’t seem to care for bananas or red cabbage; we’ll reserve those for the worms. 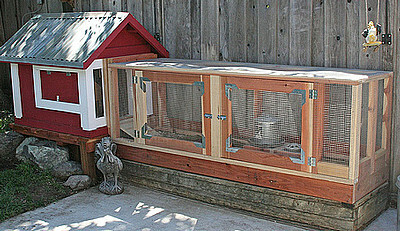 According to BackYardChickens.com, they should reach about 8 pounds each. They’re supposed to start laying early in the fall, and are reputed to be prolific, year-round layers. They’re hearty girls who handle cold conditions well, so they should be fine next winter once they get into their custom-made home. We want to free-range them, but our first attempt DID NOT GO WELL. We’re going to wait until they’re a little more comfortable, then free-range them in the evenings. 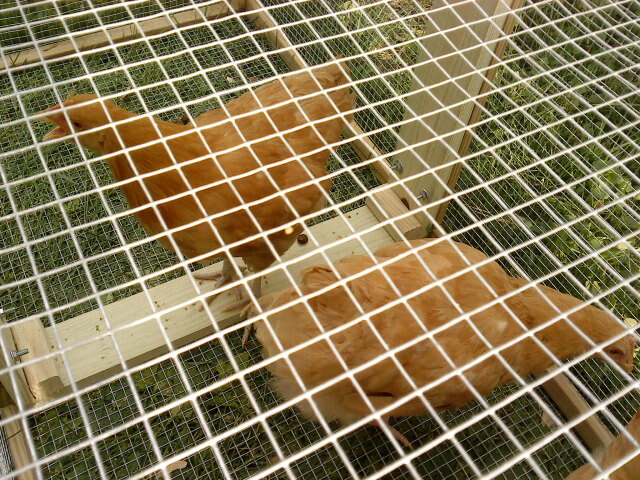 Chickens put themselves to bed at sundown; if we let them scratch the yard after dinner while we watch from the deck, they’ll wrap it up themselves and we won’t have to coax them — or catch them. "I am so uncomfortable right now." Our girls currently reside in temporary housing. 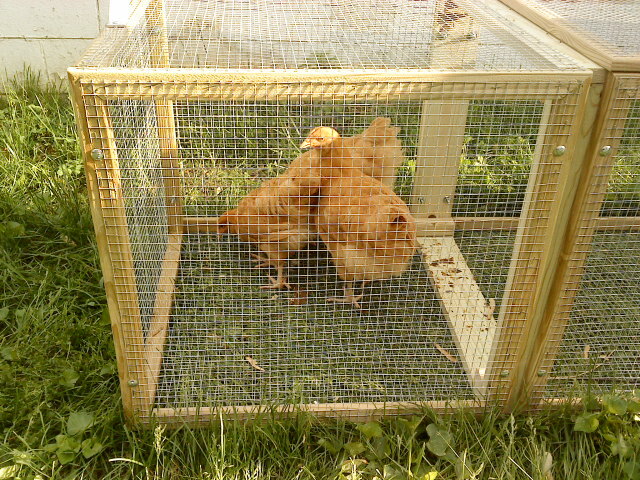 Mother Earth magazine suggested the chicken tractor that we have, but it’s not — in my amateur opinion — an appropriate long-term home for our girls. The walls are corrugated plastic, which aren’t fastened to the boards close enough to prevent dampness from intruding. We have been draping a huge sheet of black plastic over them during rainy weather and overnight to keep them dry. We want to stick with the chicken tractor format so it will be portable, but we are also trying to determine the best set-up to keep them cool on summer nights and warm during our crazy midwestern winters. The manly and manliest men are going to do the construction; we’ve explored lots of different plans, but haven’t settled on a winner. We hope to have our minds made up and everything done by mid-July. My favorite activity right now is sitting next to the tractor with a cup of coffee, staring at our sweet ladies as they bob their heads and look for tasty morsels. It may be the most relaxing way I’ve ever spent time. I can’t wait to post the first egg picture. It will be small, brown, all-natural, and perfect. I’m so excited for you guys. Chickens are so great. 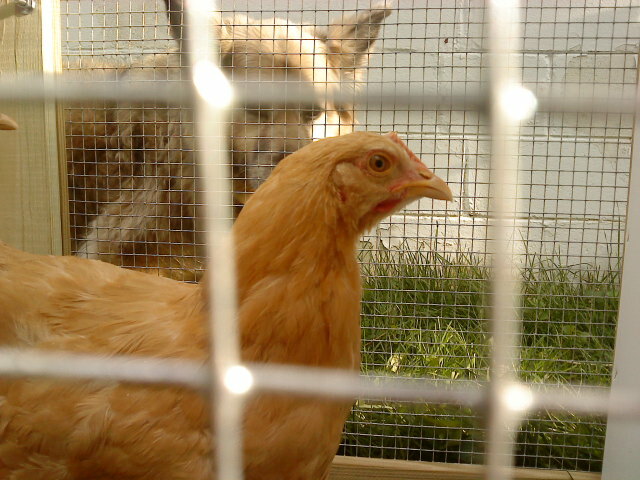 I was fortunate to have been exposed to many pets, even some quite exotic ones, but chickens were one of my favorites. They are truly neat birds and when they warm up to you, they can even be snuggly. Be careful to build them something high for roosting so that stray dogs and foxes don’t get them. Also, the only downside to having chickens is the terrible mess they make in their houses, it’s rancid, but if you keep on it more often that you think you should, it won’t be bad. I can’t wait to meet the ladies! I am going to try and make it to the local potluck this month. If you have a chance to come, we can swap chicken stories.